How many servers do I need to run Sitecore? The question above is frequently asked in a new Sitecore project. (Actually, if it isn’t, you should be worried). And there is no easy answer. It’s a bit like asking: “How big a house do I need?”. The answer to both questions is “That depends”. (and no one is any wiser). Below I’ll list some of the things you need to consider, when trying to decide what kind and how big of a server setup you need. This won’t answer your question, but leave you with many more. However if you try to find some answers for those questions, you will be a lot better qualified for estimating your Sitecore server setup. I will also provide a real world story to showcase a server setup that works for Sitecore and one that does not. A while back I was starting up a new Sitecore project for a smaller client. They had a very tight budget and wanted real world advise for a minimum Sitecore Server Setup. They came from an older 6.0 Sitecore version with 1 Content Delivery Server (CD), 1 Content Management Server (CM) and 1 MSSQL server. 3 machines to run their (small) corporate website. There was also an integration to an older Dynamics AX server, containing ERM/CRM data. The client had around 5000 users, logging into the site 1-2 times a month (so quite a small site). The new site was a complete greenfield project (i.e. 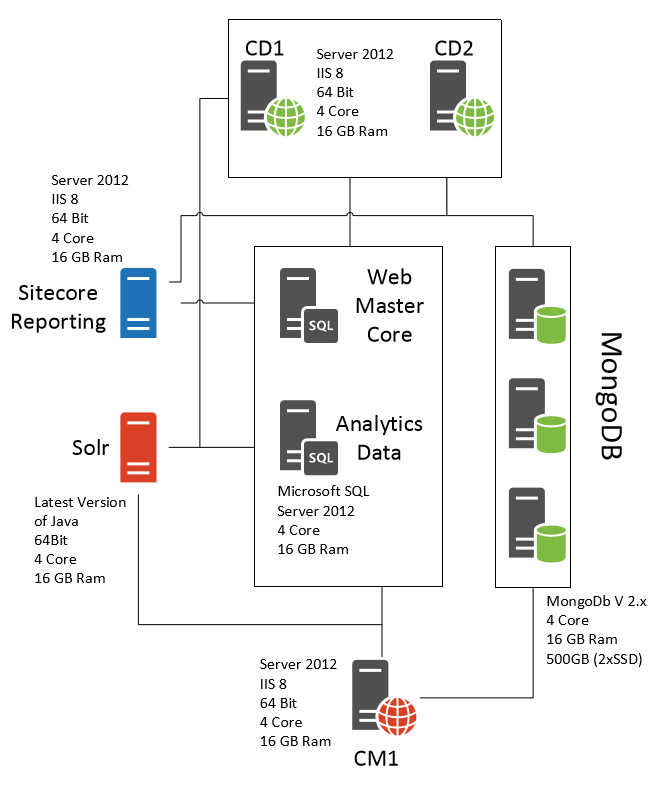 start from scratch) on Sitecore 8.0 (complete with Mongo, Solr, Analytics, etc. ), and a reworked integration to Dynamics AX. 10 servers. 10. Sitecore recommends 10 servers to run a small business site. That would be a complete no-go for the client, which was used to having 3 servers to run their site. Granted, Sitecore has become a much larger beast in the later years and targets much larger clients now. But smaller clients, like this example, still exists and has bought a Sitecore license, which gives them access to newer Sitecore versions too. I think Sitecore might have forgotten that, in these recommendations. The most obvious parameter when estimating server needs is how many page hits are you going to have. And this is quite important. So try to find out some how. If you have an old site, run some statistics for a while. If not, do some sort of analysis. Proper, fast performing, well thought out code. Even if you do not have that many page hits, you can still get a badly performing site. This is often due to bad code, which is very common. Your developer needs to know the pitfalls of Sitecore and how to avoid them, to do a properly performing site. At Pentia we have done Sitecore development since Sitecore was created. And since Sitecore was created at Pentia, we know a lot about Sitecore! We know what not to do when coding Sitecore and what the pitfalls are. Therefor I know that our code will be very well tailored for Sitecore and perform well. This means that the client can do with less CD servers and less CM servers. The client would be OK with brief periods of downtime during deployments and upgrades. This means that having a single CD server would be an option. Having 2 CD servers would enable you to take 1 server down for an upgrade while the site would still be running. Having only 1 server, saves cost, but means that the site will be down during upgrades. Some clients (mainly smaller clients) are perfectly OK with this. 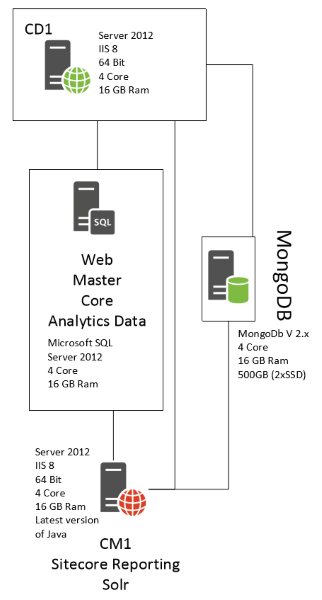 The triple redundant Mongo server setup is way, way overkill for a small client. Yes, Mongo needs 3 servers to be able to do upgrades and restoring without downtime, but smaller clients may not need 100% uptime, if it means saving 2 servers. If the site in question don’t use search very much, you might not need a standalone Solr server. The site in question did you search a bit, but has so few users, that it does not really justify a standalone Solr server. However, if your site uses search or filtering on searches a lot, you might need a standalone Solr server. The client in question was not planning on using Sitecore reporting or analytics much, if at all, to begin with. They might later, but then there is the option of adding a Reporting or Analytics server at that time. Oftentimes, interaction with 3rd party services or other systems that provide data or communicate with your site, are able to slow your site down. The user cannot see that your site is waiting for Dynamics AX to finish a webservice call to get data or something similar. To the user, it’s your site that is slow. Therefore you might need to do a lot of caching of data from the 3rd party services and store them on your servers RAM. 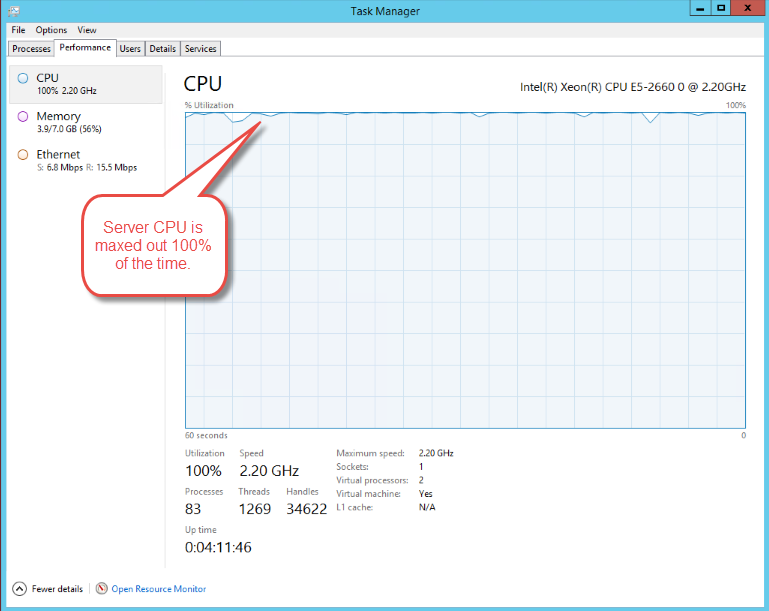 This directly affects the amount of RAM your server needs. If you have many editors working at the same time, you might need more than 1 CM server. There are many more factors to consider and many aspects will be different in your site, but the above points will help you along. Below is the setup I ended up recommending for this particular client. I kept the server scale (i.e. RAM and CPU) the same. 1 CM server that also doubles as Solr, Reporting server and Analytics server. So we went from a 10 server setup to a 4 server setup, which I’m relieved to see perform just fine, with muscles to spare for even more future users. After a while, the client decided, by themselves, to try to scale the servers down, in an attempt to save money on hosting. They told their provider to cut the CPU and RAM by half on all servers. We found out, when they called us because the site was down. This resulted in a site that either did not respond, timed out or responded in around 50+ seconds on a simple frontpage. You can safely assume that the above 4 server setup, with half the CPU and RAM, is not enough to run a small Sitecore site with normal use of search, reporting and analytics. You should also consider using cloud hosting, such as Azure, which the client in question used. The great advantage here is that they are able to add or remove servers extremely fast and throttle the servers up or down as needed. This is extremely versatile and should not be under valued. If your analysis of your hardware needs was wrong, you can relatively easily correct your mistakes in the cloud. However, it comes with trade offs. Usually, when hosting in Azure, your hosting partner, if you even use one, has no clue what Sitecore is and will be completely unable to help with any Sitecore related tasks. Be it setup of windows services that Sitecore needs, knowing what Sitecore requires or tweaking the server for Sitecore etc. This means that you need to spend time and money on handling these things yourself or pay someone else to do it. You also don’t necessarily know where in the world your data lives, which can violate local legislation in some countries. Finally, it can become quite expensive to host a site, and corresponding test and pre-production sites, in the cloud. You absolutely need to do the math on this before you decide. So, how many servers do you need to run Sitecore? There are many factors to consider, as you can see. There are no simple answer to this. You need to do an analysis of you needs and your circumstances. Counsel your Sitecore partner and try to come up with an answer that suits your needs. Nice post, and I agree for Sitecore 8. I’m curious if you think the same holds true to Sitecore 9? Thanks Mike. I no longer work with Sitecore, so I cannot answer you question.